When Mr. Obama told grass-roots organizers last week that the mandatory purchase of health insurance would “be affordable, based on a sliding scale,” the phrasing precisely mirrored language that had been poll-tested and put before batteries of focus groups by Democratic consultants over the past few years. 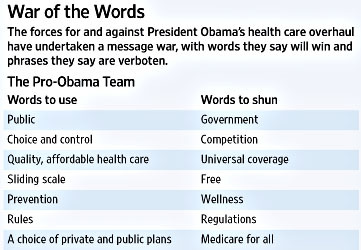 The words had been carefully chosen in an effort to take away the rhetorical targets of health-overhaul foes and replace them with terminology that would bring ordinary Americans on board. But under steady attack from opponents using more-emotional language, some of the president’s allies are rethinking the linguistic strategy. Yeah, I’d be rethinking it too. I mean, public instead of government is a no-brainer. Hell, Sean Hannity only figured out a few days ago that he ought to stop using the president’s language and instead call it a “government option.” So no problem there. But sliding scale? I don’t care how well that polls, it’s ridiculous. Nobody over sold anything by saying it was priced on a sliding scale. It sounds like classic doublespeak. The other stuff seems pretty questionable too. Choice is good, of course, but are rules really better than regulations? If you’re talking about an institution people generally like (say, schools), then maybe the softer sounding rules is better. But if you’re talking about something that people loathe, like insurance companies, wouldn’t they rather hear that you’re putting in some toughminded regulations? Something that really bites? And what’s wrong with competition and universal? Those are nice, strong words that really say something. The guys who created this list have focus groups on their side, and I don’t. So maybe they’re right. But it looks to me as if their main contribution has been to sand off the edges of the language so much that they’re practically lulling everyone to sleep. I understand they’re trying to avoid scaring people, but you need to inspire them as well. You need to appeal to their emotions. You need to fire them up not just to accept change, but to demand it. Language as relentlessly technocratic and boring as this doesn’t do the job.